Grief-Stricken Japanese Reluctant To Open Up With the earthquake, the tsunami and the nuclear crisis, much has been made of Japanese resilience. But some say that it can go too far, and that keeping emotions bottled up doesn't help. One counselor says very few people have wanted to talk about what they're going through. 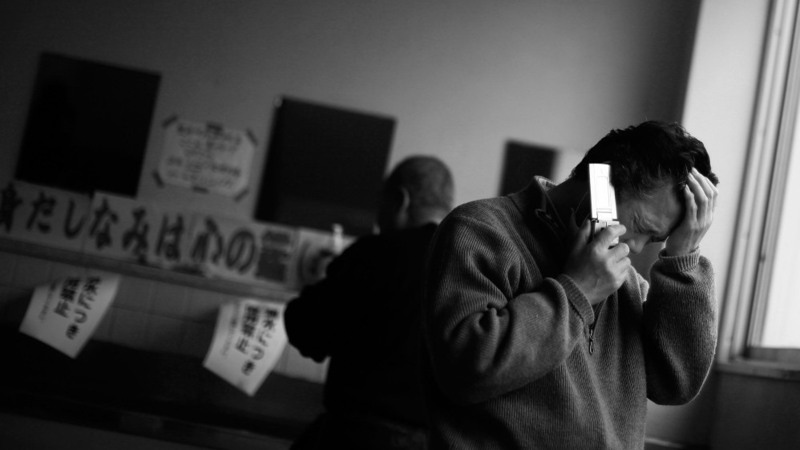 A man talks on the phone in Kesennuma Junior High School, which has now become a home for evacuees. A counselor says very few people have wanted to talk at the evacuation centers he's visited. With the earthquake, the tsunami and the nuclear crisis in Japan, much has been made of Japanese resilience in the face of adversity. But some are saying there's too much resilience, and that in times of unbelievable trauma like this, the Japanese people need to let go of their emotions a little more. Taiji Murai is a tall, efficient local Japanese official. Like almost every other Japanese person encountered by foreign journalists in the wake of the recent tragedies, he is helpful, respectful and hardworking. But on finishing an interview at the temporary government office in the fishing town of Kamaishi, and being thanked for his help in difficult circumstances, tears well up in his eyes and flow down his cheeks. He retreats in embarrassment, understandably overwhelmed by his personal, communal or national grief — or perhaps all three. An American might well do the same in similar circumstances, but it's not unusual in Japan for people to feel ashamed at showing their emotions in public, says Yoshiko Suzuki, the director of a grief counseling center in Tokyo. "Japan has a shame culture. We are very much ashamed to behave in an irresponsible way in a public place," Suzuki says. "That is demonstrated in some way in the way we express our grief. I use [the] term 'grief,' [but] some 15 years ago I don't even know that kind of term. And if I say 'grief' to quite well-educated people, [they say] 'What are you talking about? ... What is it?'" They are well acquainted with grief, if not necessarily the outward demonstrations of it, at evacuation centers up and down Japan's northeastern coastline. Towns such as Rikuzentakata have been destroyed by the tsunami, and neighbors, friends and relatives lost in an instant. Squeezed into sports halls, town halls, any halls where they can take refuge, are some 450,000 homeless people. But for this stretch of coastline, there is just one professional counselor, psychiatrist So Fujishoro. He says one thing that he's seeing is acute stress disorder — people in a daze from the trauma. But on this day, he visited five or six evacuation centers, and he says very few people wanted to talk about it at all. There is still a stigma about going to see a psychiatrist or counselor. People are still very reluctant to do it, he says, while noting that it is also still very soon after the trauma of the tsunami. In the meantime, the people have rallied together to help each other. All around a sports hall in Rikuzentakata are signs in Japanese and English saying, "All for One, and One for All." Everyone you speak to ends the conversation with a word that has taken on an almost magical, mystical status: "Gambaro," they say, or its variant, "Gambare," which translates loosely as "Go for it." 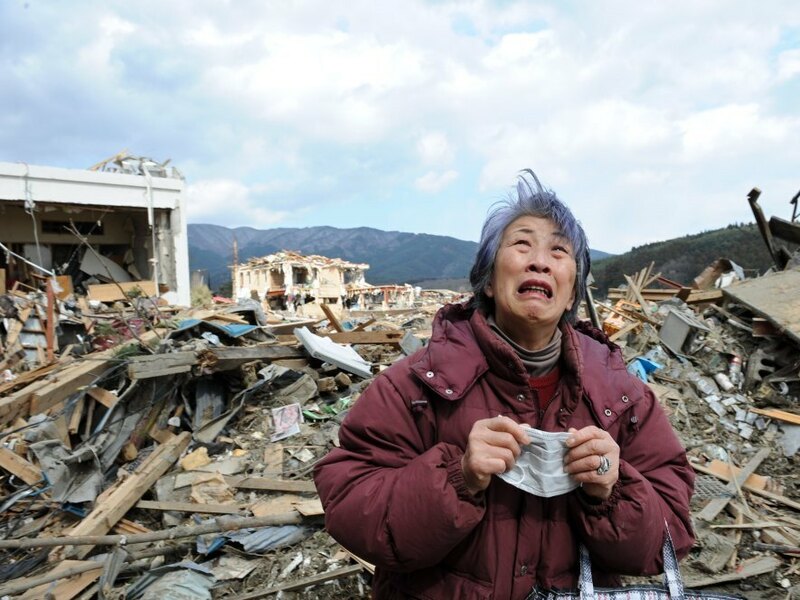 A woman cries in front of a destroyed building in the devastated Japanese town of Rikuzentakata on March 19. But it's not unusual in Japan for people to feel ashamed at showing their emotions in public, says Yoshiko Suzuki, the director of a grief counseling center in Tokyo. Yoko Kumagai, 59, sits on the floor of the hall with her daughter. "There is no other way that we can survive than we say to each other like a prayer, 'Gambare' — go for it, go for it, be positive, be positive," she says through an interpreter. "That's why we say that a lot. I actually saw my houses washed away and everything is lost, and I try not to think ... big picture, and I just keep this word, 'Gambare.' That's all I can do." Grief counselor Suzuki says that's fine, and it's important, and Japanese patience and inner strength are admirable. But she says whatever culture you are from, keeping it all bottled up doesn't help. "I don't deny this 'Gambaro' spirit at all," she says. "We all need this. But at the same time, even if you are very strong personality, we cannot deny that trauma affect people ... and whether you like it or not, whether you admit it or not, your brain has been affected and we need some help." Victims of these tragedies may reach out for that help in the weeks, months and years ahead. In recent decades, foreign and Japanese observers say, Japanese people have already been changing, just as Western people changed, with modernization and globalization. And sometimes the national character is shaped by the triumphs of economic success. And sometimes it is forged on the anvil of deep, dark tragedy.